Well….spring was official March 20, but I don’t think anybody thought it actually arrived. I wore my winter coat one day last week. Snow has surprised us and rain has besieged us leaving some of us on the moody side. I know God is in control of the weather, but its unpredictable~ness suggests an attitude all its own. I find it completely frustrating. Sometimes winter just seems to drag on too long. Unfortunately, my mood can match the gray of the clouds I see rolling across the great expanse of sky above me. On and on they seem to go with no break between them to shine the light of the sun. I know the sun’s there, but I want to see it. I want to feel the warm rays on my face. I want to wear my cute little sunshades and take a walk around town without an umbrella weighing me down. I want to see the buds on the trees and the birds feeding on the new green sprouts of grass. How can anyone be sad or moody when they hear these lyrics? Listen to Al Jolson or Bing Crosby or Doris Day sing it on YouTube for yourself and I guarantee it’ll put a smile on your face. The music is fun and upbeat and expresses the way a soul really longs to feel. Did you know a robin is one of the most abundant birds in the country? Who hasn’t watched a robin bob bobbin’ along the ground in a backyard or hop hoppin’ along the branches of a holly tree? I saw one last week in that ice cold weather, fat and fluffy without a care in the world, it’s bright orange-red belly setting it apart from just about every other bird on the planet. I mean, come on…they’re so plentiful, everybody knows a robin when they see one. Have you ever wondered why there’re so many of them? Why they’re so recognizable? Why they’re so indigenous all over America? Robins are supposedly migratory, but that doesn’t mean some of them don’t stick around all winter long. They just seem to have a different kind of spirit that makes them strong and adaptable. 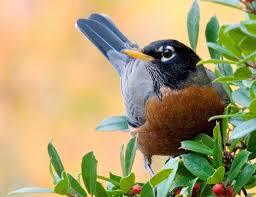 A robin is one of the first birds to build its nest in the spring after returning home. It’s one of the first birds to lay its eggs and one of the first birds to awaken the dawn. I think that’s what I love the most. The robin rises with the sun, whether it’s shinin’ or not and belts out a tune. It bobs along in life, with a dance in its step and a song in it’s heart because that’s what it was created to do. I long to be one of those people who rise with the sun, a song in my heart. I long to awaken the dawn not just on bright shiny days, but every day. I know this is possible, but I don’t always live like it is. Today, the sun is actually shining. Oh happy day. I’m thinking my winter coat is officially retired for the next eight months. Spring is on the loose. The daffodils are bursting forth and the blooming pear tree outside my bedroom window attracts every bird this side of Raleigh to feed on the pods, including the robin. A word to the wise…don’t park your car under a flowering pear tree in the spring. Just sayin’. Funny how this tree can be so absolutely beautiful but smell so absolutely bad. Sorta like my mood when it matches the weather, but how much more do I appreciate the beauty of spring after the deadness of winter? How much more do I appreciate the brightness of the sun after the darkness of cloudy skies? We all have tough times. We all have seasons when life is hard, but one of the things I’ve learned in my faith journey is that even when things seem dark the light of Jesus is always there. God always shines His Light in dark places. Winter seasons do not last forever. More importantly, you can’t have spring without winter. The earth needs to lie dormant for a season to produce a beautiful spring. So I wake up. I get up. And I laugh. Yes, there will always be cloudy days, but there will always be Jesus to greet me. He’s the Sonshine in my heart. Because of Him, I have a different kind of spirit. Because of Him, I keep bobbin’ along.